Preschoolers and Peace - This is the landing page for all the Preschoolers and Peace blog posts. If you are thinking - I know they had that post about that thing, you can click over to this board and have a quick look and you'll find it. To Read - I have a family of readers, so I am always looking for good books for the kids to read. Or myself. Whenever I see a good book list or a book recommendation for myself, I will pin it here. Before heading to the library I will visit a few of those posts and jot down book titles or authors so I'm armed with what I need to find some good books. To Do With Fam - This is where I stick all those posts that are full of ideas of fun things for us to do with our family. When my husband and I are having a discussion about what to do this coming weekend or on a staycation, I'll whip out that board and voila! To Eat Crockpot - My crockpot saves my housekeeping rear-end frequently. It just makes it so much easier to stick dinner in the crockpot in the morning when I'm cleaning up breakfast and then not have to think about it. This board lists some of the many, many ideas available all over the internet. Homeschool Art - I am NOT an arty mom. I like to buy art supplies, but they often go unused. When the time comes and I know that we need some art time, I can open this board and pick an idea and we almost always have an excellent time creating. Cooking for a Crowd - It's dinner for 10 almost every night at our house, except when friends are added and then it can be dinner for 20 or more! I started Cooking for a Crowd to gather recipes that are easily adaptable to the big group. Or a summer camp. Circle Time - You all know how we love Circle Time here! Other families do, too, and I've gathered their ideas and Circle Time plans as well as new resources we love. Crafts for Boys - I have a crafty 7-year-old who's always asking if he can create something. I started searching for crafts boys might like and then created the board so your crafty boys can keep busy, too. 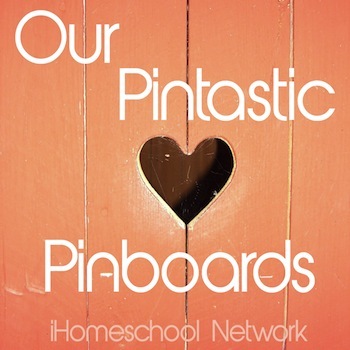 HomeschoolingIRL - Your one-stop Pinterest board for all things HomeschoolingIRL. You can find the episode links, posts, and other IRL-related pins. More Christ in Christmas - The real reason for the season and all sorts of resources, recipes, and celebratory ideas. Want to see more great Pinterest boards? Click the graphic below or check out The Ultimate Cream of the Crop Pinterest Boards That All Homeschoolers Should Follow.